Spot dolphins in Holdfast Bay on a dolphin-watching cruise from Adelaide. Setting sail from Glenelg marina on a catamaran, you all sail out onto the bay for a 3.5-hour cruise. As thousands of dolphins live in the bay, you are guaranteed to see these lovable marine mammals. If you want to increase your fun, upgrade to include the chance to swim with them! Take a 3-hour cruise by paddle wheeler on the Murray River. After departure from Murray Bridge Main Wharf, enjoy a 2-course lunch and take in the untamed natural beauty of the Murray River. Travel to Kangaroo Island for the day to take a small-group wildlife safari by 4WD. You all see koalas, kangaroos and sea lions on Kangaroo Island, South Australias wildlife haven, and discover the islands wild rugged beauty. Enjoy personal attention from your guide on this small-group tour, limited to 12 people, and travel to Kangaroo Island by round-trip ferry or upgrade to fly from Adelaide. This food and wine experience showcases the boutique and the more well know wineries and gourmet culinary delights of South Australia's famous wine region - The Barossa Valley. A fantastic day exploring Adelaide's beautiful McLaren Vale wine region where you will enjoy wine tastings from some of the most popular cellar doors and local produce that this region is known for. A fantastic day exploring Adelaide's beautiful Hahndorf, Goolwa, Victor Harbor and McLaren Vale wine region where you will enjoy wine tastings at cellar doors and local produce that this region is known for. A fantastic half day exploring Adelaide's beautiful Hahndorf. Take a walk on the wild side and engage with some of Australias much-loved wildlife on a tour to Cleland Wildlife Park, just 30 minutes from Adelaide. You'll discover more than 130 species of native animals while becoming immersed in the wonders of this natural bush environment. The tour includes talks by the park keepers, observe the koalas, kangaroo's, emu's and potoroos. Experience Aussie bushwalking, a BBQ with native spices, and wine on this small group guided tour. Be amazed by some of the most breathtaking natural landscape, only 30-minutes from Adelaide, as you follow a 7km trail to explore this scenic national park. You'll witness an abundance of native flora and fauna set among amazing rock faces, gorges and seasonal waterfalls while discovering the Valley Walk, Giants Cave, Morialta Falls Plateau Hike and Eagles Nest Lookout. Learn about the parks early history, native plants and animals found in the region as you see native animals within their natural environment, including koalas nestled high among the majestic gum trees.As the trail comes to an end, the experience continues at the eco-certified Sinclairs Gully Winery where you can taste the vignerons cool climate wine and relax over an Aussie barbecue with native ingredients and spices a perfect way to end your eco-adventure! Immerse yourself in nature on a self-guided hike from Waterfall Gully to Mount Lofty and be rewarded with the panoramic views at the summit, overlooking the Adelaide Plains and Gulf St. Vincent. Then follow the trail to Cleland Wildlife Park where you can spend the afternoon hand feeding the kangaroos and getting up close to the many native Australian animals, including the ever cut Koala's. Round-trip hotel transport plus water, snacks, and a map are provided. The hike to Mount Lofty Summit is graded as hard - it involves steep sections and uneven services and a good level of fitness and mobility is required.The total walking distance to the summit and Cleland is approx 6 km. Full day touring, Offering door to door service in Adelaide CBD, Glenelg and surrounds, visit 4 wineries, Maggie Beers Farm Shop, Barossa Cheese and if time permits a drivers choice. Small group tour generally no more than 12 people, offering an intimate and personal day exploring the Barossa. We offer door to door service for our customers. Your day will include great wine, picturesque views, meeting interesting local characters, trying amazing local foods and enjoying lunch with your new found friends. Highlights we generally visit are iconic places such as Maggie Beers Farm Shop, Seppeltsfield Winery, enjoy wine tasting and gourmet platter lunch at a winery like Grant Burge Winery. Enjoy visiting Barossa Valley Cheese, the picturesque views of Mengler Hill and to really top of the day wine tasting at a couple of our tour guides special hidden secrets. Allow our multi award winning team the opportunity to showcase some of the highlights of the Barossa. Experience the hospitality of McLaren Vale on this small group day trip with maximum 13 people on tour. Taste locally made wines and produce while being accompanied by your local, professional, tour guide. Enjoy the personalise service from our multi award winning touring business discovering the wonders of this great region. Experience a day of discovery, Mt Lofty, historic Hahndorf, and the Adelaide Hills Region, wine, cheese and chocolate. Enjoy the spectacular views, rolling hills and seasonal changes all in a small group tour with maximum 13 people on tour. Offering more intimate and personal service from our multi award winning touring business. Experience the best of Adelaide Central Market's on this 2-hour tour. Home to over 80 product stalls, Adelaide Central Markets have become a 'Foodie Heaven' located conveniently in the heart of the city. Discover the history of the markets as your guide takes you on an in-depth tour and local gourmet tastings along the way. Experience the stunning Adelaide Hills on this day trip from Adelaide. Taste some of Adelaide Hills incredible wines and explore the Australias oldest German Town, Handorf. Visit Beerenberg Strawberry Farm, Melbas Chocolate Factory as well as Woodside Cheese for delicious tastings. Enjoy a relaxed and unhurried small group tour with a maximum of 10 people as you visit the the world famous Barossa Valley wine region; approximately 1-hour 15-minute drive north of Adelaide. Throughout your day, you'll visit four different wineries and enjoy a delicious lunch. Enjoy a relaxed and unhurried small group tour. Langhorne Creek is South Australias undiscovered wine region, approximately a 1-hour drive South East of Adelaide. The Clare Valley is a hidden gem amongst the vines, a leisurely 2 hour drive from Adelaide; Clare is recognised as the Riesling â€œCapitalâ€ of Australia. It is Australiaâ€s smallest and one of the leading viticulture regions.Â It is famed for its wine and pioneering heritage. Dumplings are soul warming, delicious little parcels of goodness and we want to show you where the best ones are on this dumpling feast walking tour! Relax, enjoy the heavenly flavors and learn some new and quirky things about Adelaide that you may not have known! Take two days to discover the wildlife of Kangaroo Island from Adelaide. 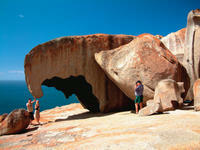 Youll see pelicans, sea lions, koalas and, of course, kangaroos, and experience the wild beauty of Kangaroo Island. Youll also visit several island attractions, including Seal Bay and Cliffords Honey Farm. Some meals are included, and you can choose to travel to Kangaroo Island by round-trip ferry, or upgrade to fly there or back from Adelaide. The journey between Adelaide and Melbourne is full of scenic diversity. Birds eye views of cities, vast farmland, famous wine regions, extinct volcanoes, coastal icons, shipwrecks, rainforests and winding clifftop roads. Add to this some great food and wine and small group of like-minded travellers and you have a very memorable 3 days. The itinerary has been carefully planned so that you will take in many different experiences while keeping the schedule at a comfortable and relaxed pace. The first part of this tour through farmland on route to Naracoorte Caves and the Coonawarra wine region is less visually spectacular and is therefore done at a faster pace to allow more time on the Great Ocean Road. Traveling in a small group of no more than 8 people will also allow you more time at places and a more personalised experience. Experience the amazing giant cuttlefish on this 2-day, small-group trip to swim among them and their brilliant displays of luminescent patterns and colors. Learn about these colorful creatures from a marine expert, as well as go sightseeing through the spectacular wilderness of the Southern Flinders Ranges. You will also hike along the rugged Alligator Gorge in the Mount Remarkable National Park. Three of Adelaide is finest must do is rolled into one amazing experience! Start your day exploring the culinary capital of South Australia with a guided tour of the Adelaide Central Market, a mecca of over 80-artisan food stalls, cafes and wine stores. Then with your gourmet packed lunch in hand it is off for a short stop at Mount Lofty Summit to witness the amazing views across Adelaide before arriving at Cleland Wildlife Park. Cleland is the best place in Adelaide for a hands-on encounter with Australia is most unique and curious wildlife including the ever favourite koalas, kangaroos and wallabies. Follow winding hiking trails through the Australian countryside at your own pace on this self-guided hike from Waterfall Gully to Mt Lofty from Adelaide. Trek along the 2.5-mile (3.9-km) route at your leisure, and pass tumbling waterfalls and shimmering streams. Along the way, admire the beautiful countryside for which Australia is famous and watch the treetops for sightings of sleepy koalas. At Mt Lofty is high summit, enjoy rewarding views over the rugged terrain to coastal Glenelg and Port Adelaide. This hike is graded as hard - it involves steep sections and uneven services and a good level of fitness and mobility is required.The total return walking distance is 7.8km. This half-day bushwalking tour features the wildlife and unspoiled natural landscapes of Morialta Conservation Park, located just 30 minutes from downtown Adelaide. Follow your guide along nature trails with an abundance of native flora and fauna set amid sheer rock faces, gorges, and seasonal waterfalls. Morialta is one of the best places in Adelaide to see Koala's in the wild! This is a moderate graded hike. The total distance walked is approximately 6 km over 3 hours. It involves some steep inclines and uneven surfaces and an average level of fitness and good mobility is required. The price quoted includes up to 6 guests. This wine tour is a cut above the rest; it gives a great opportunity to match chocolates with unique wine and teaches you what really goes on behind the doors in the makings of wine. Choco Vino experience at Hahndorf Hill Winery matches there boutique wines to the world's most acclaimed chocolate; it's a global adventure for chocoholics. If you've ever sat with a glass of wine and thought 'I could do better!' then here is your chance. Become a master winemaker for the day with an experience especially designed for discerning wine-lovers with Make Your Own Blend experience in Penfolds laboratory in the Barossa Valley. The price quoted includes up to 6 guests. McLaren Vale, where the vines meet the sea. Only a 30-minute drive from Adelaide, this beautiful wine Mecca province has a Mediterranean climate and is arguably one of the premier Shiraz growing regions in the world. A tiny piece of paradise with two passions food and wine. Driving over the first row of hills, you will be met by a vista of undulating vineyards with the backdrop of the picturesque wave-like Mt Lofty Ranges rolling to the sea. Every tour is tailored to suit the individual and focuses on visiting niche, boutique wineries as well as major iconic vineyards and main regional attractions. Enjoy the Barossa Valley, Adelaide Hills or Mclaren Vale in your own private tour. Stopping and starting at the wineries and tourist attractions that you request or is suggested. Travel with your own driver guide in a seat belted and air-conditioned Toyota Commuter. 8-hours of fun, wine and tourist attractions. Once you have booked, you are able to go over your itinerary with your local operator to make your special day truly memorable. The price quoted includes up to 6 guests. In the morning, you will be introduced to the city of Adelaide, surrounded by parkland with a blend of historic buildings, wide streets, cafés and restaurants. Drive past Adelaide's cultural precinct - North Terrace - we then stop for a short break at National Wine Centre of Australia. Botanic Park, home to the Bicentennial Conservatory and the Adelaide Zoo. Continue through to historic North Adelaide and visit St Peters Cathedral and the Adelaide Oval. Next stop is Haigh's Chocolates for a tour and tastings at this iconic South Australian company. Your afternoon commences with a scenic drive to Mount Lofty Summit. Take in the spectacular views of the city and the coastline - a perfect photo opportunity. We then arrive at Hahndorf, This is the oldest surviving German settlement founded by Lutheran who immigrated to Australia in 1830, you will have enough time for a taste of traditional German beer at Adelaides oldest German settlement. All the best highlights in one amazing tour Adelaide Central Market, Iconic City Sights, Penfold's Winery, Cleland Wildlife Park and Mount Lofty Summit! Make the most of your time in Adelaide with an all-inclusive cruise ship excursion which offers the perfect opportunity to experience some of South Australia's best known locations. With complimentary pick up and return service directly to your ship, enjoy the day worry free. Adelaide has one of the most unique city layouts in the world largely because it is surrounded by a vast sea of green space called The Adelaide Parklands. On this experience you will escape urbanity and getaway into the natural surroundings that characterises Adelaide. Youll venture through the cycle-dedicated Adelaide Parklands Trail along a route where you will encounter Adelaide's cultural institutions, iconic buildings, The River Torrens, North Adelaides resident horses, city parks, gardens, award-winning landscape architecture and much more. You will bare witness to a beautiful blend of urbanity and nature in one seamless journey from the comfort of our luxurious bamboo-bodied electric-assisted vehicles, operated by your highly trained local host. A fun, easy, guided day tour cycling in and around the beautiful vineyards of McLaren Vale with pick up and drop off in Adelaide CBD, bikes, guide, lunch and wine tastings all included. A great fun day of relatively easy cycling, with an exclusive platter style lunch and a minimum of 2 cellar door wine tastings. Explore some of the secret spots of the 'Vale' as it's known by locals, sample some of Australia's best wines and enjoy the scenic cycling in this gorgeous seaside region. Enjoy a stress-free start to your stay in Adelaide CBD with this convenient and comfortable luxury transfer from Adelaide Airport to your accommodation. Plan ahead to avoid waiting in line for taxis or public transportation. With this airport transfer, your private driver will pick you up from the international or domestic terminal and take you directly to your Adelaide CBD&nbsp; hotel in the most luxurious and spacious vehicle available. Enjoy a 3.5 hour food and street art walking tour of Adelaide CBD with your local guide. Discover a mix of history and modern day quirky street art as you venture through the streets of Adelaide tasting a number of gourmet sweet and savory snacks along the way. Stop for a delicious lunch in one of the local cafes or restaurants before finishing your walking tour. Experience Adelaide like a local on this fun, unique and fully guided small group bike tour that takes you from the city to the beach! Enjoy a relaxed and easy ride through the heart of the city to the vibrant Riverbank Precinct, along the serene trails of the River Torrens and onto the blue seas and golden sands of Henley Beach. After a well deserved break and delicious morning tea, enjoy striking coastal views as your ride continues along the spectacular foreshore to reach the cosmopolitan town of Glenelg. No need to cycle back - stay and enjoy the seaside! *Catch the tram back to the city at your leisure, or if preferred come back in the pureSA vehicle upon arrival in Glenelg. Enjoy an easy-paced 2 hour small-group walking tours along North Terrace in the city of Adelaide. The focus of the tour is on history, heritage and culture and covers not only the architecture and history of the varying buildings but also the people who have been associated with them, and the stories about Adelaide's development from colonial times to today. Most of the sites visited are public institutions, statues and monuments and tour participants, whether they are locals, interstate visitors or from overseas get to experience the essence of what Adelaide is all about. Join an easy-paced 2 hour small-group walking tours around Victoria Square in the city of Adelaide. The focus of this tour is on history, heritage and culture and covers not only the architecture and history of the varying buildings but also the people who have been associated with them, and the stories about Adelaide's development from colonial times to today. Most of the sites visited are public institutions, statues and monuments and tour participants, whether locals, interstate or from overseas get to experience the essence of what Adelaide is all about. The Kayak Tour explores the Dolphin Sanctuary and Ships Graveyard Maritime Heritage Trail, just 30 minutes from the Adelaide CBD. Here you find one of Adelaide's "secret spots", it is an area of surprising beauty. The sheltered mangrove lined creeks are home to a fascinating array of marine life, birds and the Port River Dolphins. The Ship's Graveyard is a unique feature of the area with over 20 "wrecks" to view. All this makes for a sensational adventure and kayaking is the most environmentally sensitive way to explore and interact with the dolphins. Small-groups of no more than 14 make this a personal experience. Perfect for the whole family, enjoy an up close look at the native wildlife and wrecked ships as your guide tells you tales of this mysterious area.